My top, boven 5 4Minute songs; which is your favorite? de keuze van de fan: Black hair? What muziek Video Did Sohyun Look The Best In? It’s been announced that 4minute‘s Gayoon will be making a short appearance as actress Lee Ji Ah‘s friend on ‘I’m a bloem Too‘! On Octobe 18th, a bron revealed that Gayoon finished filming her cameo as a high school student, who was a childhood friend of Cha Bong Sun (played door Lee Ji Ah), on October 16th. Idol groups B2ST and 4minute were recently spotted at Gimpo airport, as they headed for the United Cube concert in Japan. The toon will be held at the Budokan in Tokyo on August 25th. United Cube Concerts are different from other idol shows, because they are held meer like festivals than large-scale concerts. Concertgoers can expect to see performances from 4minute, B2ST, G.NA and other members of the Cube Entertainment family. On June 22nd, HyunA and Lee Joon were seen together on a flight that was heading from Okinawa, Japan to South Korea. The two singers sat together in the first row of the business class section, and were reportedly seen acting like a couple throughout the two-hour flight. 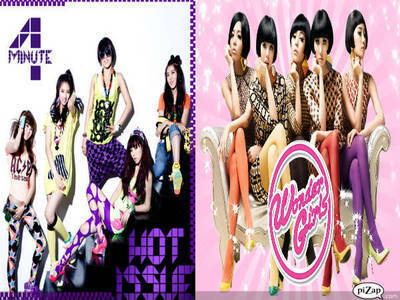 Who's the member of 4minute is from Wonder Girls?